Will you translate your interest in weight loss and a healthy lifestyle into action this weekend? Here are some easy tips for how to stay on course with your diet and exercise plans while having a fantastic weekend! Look ahead to identify times when you’re likely to be tempted to indulge. Do you have a party to attend? Planning a weekend BBQ? Going out with friends on Saturday night? If you know you’ll be offered high calorie foods, don’t despair, prepare! Have an apple or another piece of fruit just before going out. It won’t ruin your appetite, but it will ensure that you’re not famished when you arrive at your event. Plan what you hope to eat when you arrive at a party. If healthy options are offered, start with those before enjoying some treats. 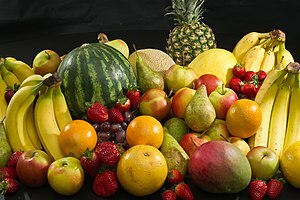 Plates of fresh fruits and raw vegetables are often served at parties. Make that your first stop. After a piece of fruit at home and some fresh fruits or veggies at the start of the event, go ahead and indulge without guilt. It’s unlikely you’ll really overdo it after filling up on high fiber, low calorie produce. Schedule some exercise into each day. Plan to get it in before your day takes off and time gets away from you. If you can, include family or friends in your exercise to make it social. Since my kids wake up early, I load them into the bike carrier and pull them behind me while I ride to a park. At the park, I don’t sit on the bench, but rather run, climb, swing and lift them. Between the bike ride & the park, I’ve gotten a pretty decent work out in before 9 AM. You can do it too! Let’s talk alcohol! If you know your social life includes drinking on the weekend, it may not be realistic to make abstinence a dietary goal, but you can temper your intake to reduce calories and ensure you feel great when you wake up the next morning. Start your evening with a glass of Pelligrino and add a twist of lime. Over the course of the night, alternate this with your alcoholic drink of choice. Alternatively, make a refreshing white wine spritzer to reduce your calorie and alcohol consumption. Mix ice and 2/3 wine, 1/3 zero calorie sparkling water and a slice of any citrus fruit. This refreshing option is a good alternative to full calorie alcoholic beverages. Opt for weekend activities that include movement. Skip sedentary options like meeting friends for lunch or watching a movie. Instead, go to the Botanic Gardens, an art museum, a forest preserve, the beach or pool. You might include something as simple as a brisk walk with a neighbor. Your goal should be to move more! Keep your focus positive this weekend when it comes to weight loss. Make a plan for adding in the healthy things…lots of fruits, vegetables, exercise and general movement. When you’re mindful about how you’ll prioritize your health, things like fast food and sedentary activities will be squeezed out.